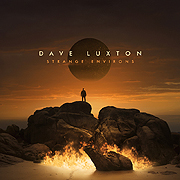 From the grain of dust lying in Earth's orbital plane, to interstellar clouds and vast plumes of vaporized debris, the music of Dave Luxton portrays the magnificence of the cosmos - and attempts to connect us to our own inner universe. Strange Environs (51'43") contains nine tracks, each a unique spell cast by Luxton's slow motion synthesized fields of harmony and grandeur. His music is serene and calm, and meant to liberate these states which already exist within each listener. Atmosphere, texture and mood all unite in gentle converging psychological currents. Ethereal melodies play out across a building electronic choir, until darker notes remind each of a coming wrath. Secret tones emit warm glows amid rushing forms, as abandoned solo lines echo and hover above undulating sonic designs. Strange Environs bestows upon us a feeling somewhere between the dreamy realms of ritualistic portent and galactic comfort. This work is in no particular hurry to get to its destination - we shall arrive whenever we get there. Luxton knows he cannot provide us with meaning, but does offer a path towards it - striking deep chords that words cannot approach.